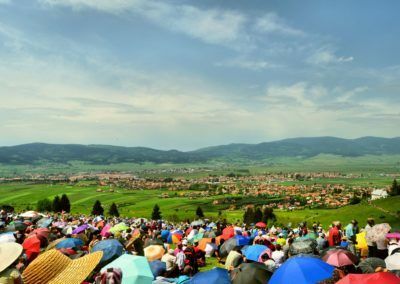 Famous for its Ciuc Beer, its enthusiasm for hockey and for being one of the coldest cities in Romania, Miercurea Ciuc is a unique place certainly worth visiting during your stay in Transylvania. 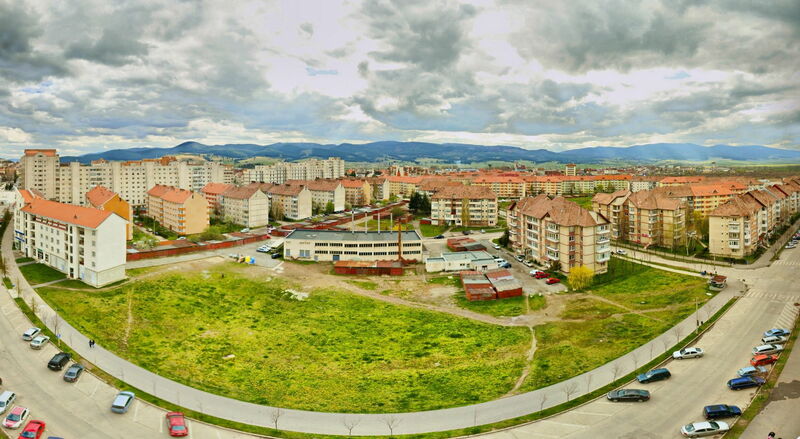 The city, located at the foot of the Eastern Carpathians, is without a doubt the heart of the region. 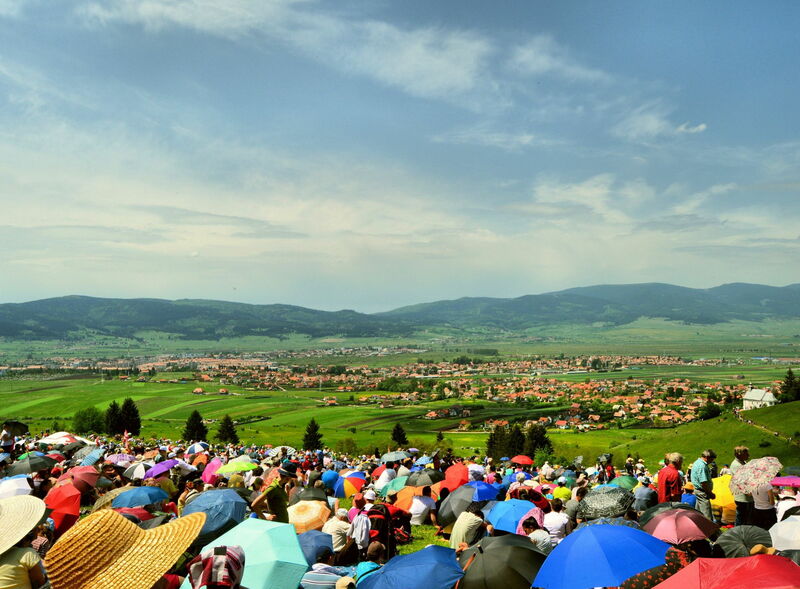 Besides being the capital of Harghita County with almost 40 000 inhabitants, it is the hub of the Ciuc Basin, full of diverse cultural events, such as the Pentecost Pilgrimage in Sumuleu Ciuc with hundreds of thousands of pilgrims coming from every corner of the world, the International Jazz Festival and the City’s Days, both organized in July, or the Day of a Thousand Szekler Girls. Along with these, there are countless other chances to dive into the town’s culture: concerts, comedy shows, theatre plays, festivities, exhibitions, sport matches and street events throughout the year. Among the many other attractions, tourists can visit the Mikó Castle, one of the town’s main and most important edifices. It is a fortified castle built in the 1630s, which played an important military role throughout the centuries, first as a barrack for Habsburg troops, later as residence of the commander of the 1st Szekely Regiment of the Transylvanian Military Frontier, then as the headquarters of Sandor Gal, commander of the Szekler revolutionary forces during the Transylvanian Revolution of 1848. 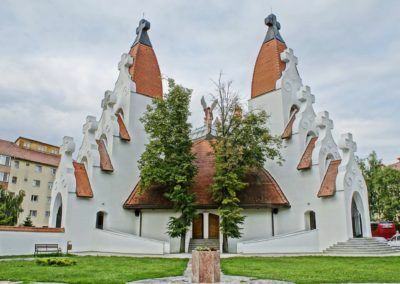 Since 1970, it gives place to the Ciuc Szekler Museum, which awaits its visitors with temporary and permanent exhibitions and different cultural events for both children and adults. 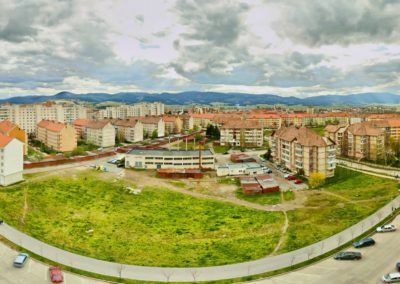 Another area worth visiting is the Sandor Petofi Street, located in the centre of Miercurea Ciuc, which is a fully pedestrian zone, filled with many terraces, providing a friendly and romantic atmosphere. Not far from it there is the town’s Central Park, which is a wonderful place to relax while listening to the song of the numerous bird species living there. Miercurea Ciuc is a town where Christian tradition plays a significant part in locals’ lives, which provides opportunities for visitors to travel in time by observing and participating in centuries-old customs and rituals, as the “Burying of the Fărșang (Carnival)” at the end of February, “watering of the girls” on Easter Monday, Harvest Ball in the autumn or even a traditional wedding. 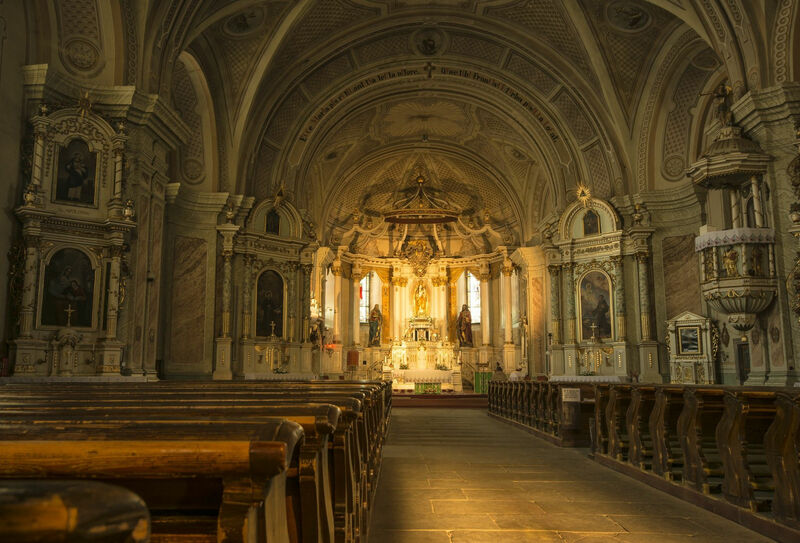 Due to the city’s Christian roots, there are many spectacular churches. 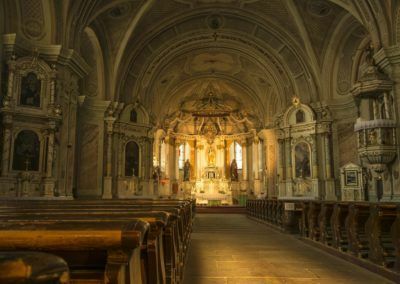 Probably the most famous one is the Franciscan Monastery, the construction of which started in the 15th century, and later on was rebuilt in the 1800`s in a baroque style. Here can be found one of Transylvania’s most beautiful organs with 2824 pipes. However, the monastery’s most precious item is the statue of Mother Mary and baby Jesus, made of lime-wood in the 16th century in a renaissance style. 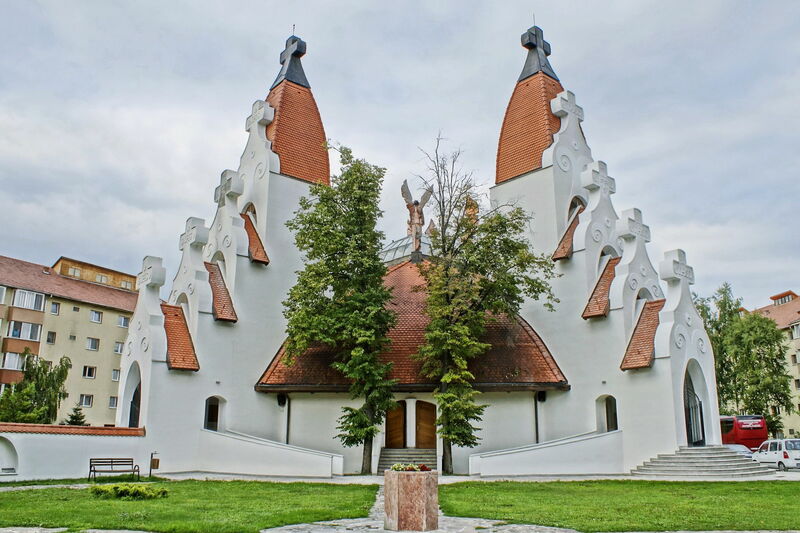 Another famous church is the Millennium Church, which was built based on the plans of Imre Makovecz, renowned Hungarian architect. Even though there are countless other events and sights worth seeing, the town’s true magic lies in its wonderfully peaceful and familiar atmosphere. Being surrounded by mountains, forests and traditional villages, there are almost infinite possibilities to explore the region’s picturesque scenery and to rediscover the deep relationship between humans and nature. Villages like Cetatuia, Potiond and Frumoasa as well as the breathtakingly beautiful Baile Harghita lie within easy reach. 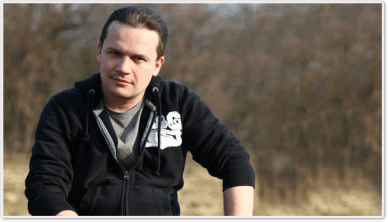 The latter one is a perfect destination for a backpacking adventure during the summer, while in the wintertime it transforms into a ski paradise, suitable for beginners and advanced skiers as well. Last but not least, as being somebody born and raised in this town, I can tell you it is not a coincidence that the crest of Miercurea Ciuc consists of three forget-me-nots growing out of a heart, because due to its magical, relaxing atmosphere and friendly and helpful locals, this is a place full of heart and soul, which will be certainly impossible to forget.